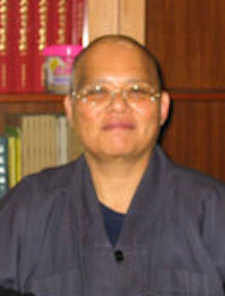 Bhiksuni Hong-Xiang does social work. She was the first Bhiksuni in Taiwan to earn a degree in Early Childhood Education. She has taught young children and offered counseling at Chang-Guang Orphanage. She is also certified in sign-language for communicating with hearing-impaired persons. Bhiksuni Hong-Xiang teaches Dhamma in the prisons and was acknowledged and honored with an Outstanding Counselor Award by the Legal Affairs Department for her work in the prisons. Bhiksuni Hong-Xiang is concerned about the well-being of women and children in society so she became the abbess of Jing-Ci Temple in Taipei. She has worked in the area of precept training and higher ordination for women. Bhiksuni Hong-Xiang established an international linkage with Korea for exchange visits between nuns from her temple and those in Korea. Bhiksuni Hong-Xiang has a heart of gold and has contributed to social work development in Taiwan.